Back in 2001, my friend Kim (that perfect sort of mother who eventually drives most of us mere mortals into therapy with her reindeer food at Christmas and sparkly coins from the tooth fairy — you know the type, right?) 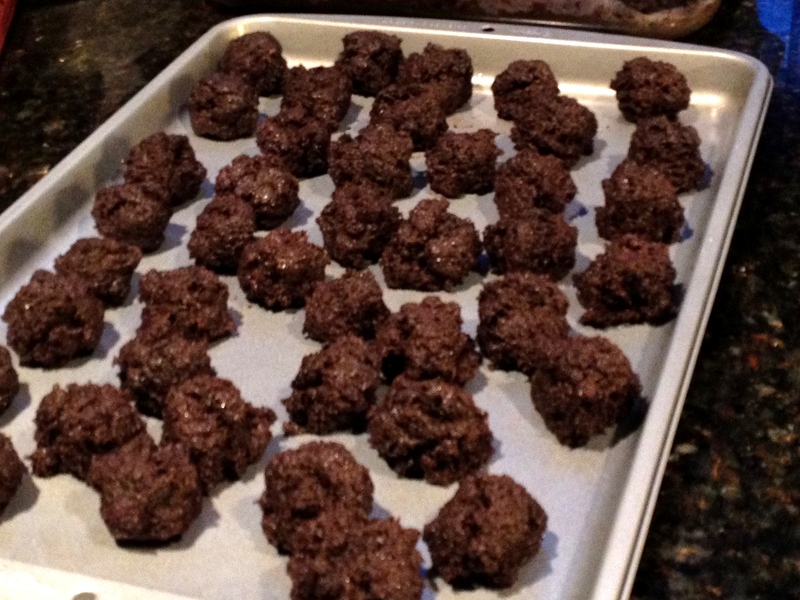 was on a website devoted to preschool crafts and age appropriate holiday ideas, and she discovered a recipe that admittedly sounded pretty gross: cake balls. I do believe we all had a good laugh about it. A hot cake smushed together with store bought frosting and then dipped in melted chocolate? What exactly was the thought process that went into creating that? Was this lady seriously PMSing and madly rifling through her pantry in search of something — anything! — to dip into chocolate? Or was she an evil genius? We will never know. But the recipe haunted Kim, and the following Christmas she did some experimentation. After some trial and error, she shared her technique with her friends. And when we got done laughing, we discovered these things are actually quite good. If you’ve kept up with this story, you have figured out it was 2002 when we christened Kim’s Jingle Balls. 2002! Nine years ago! It took me a couple more years to try them myself, being a bit of a boxed-cake and fake-frosting snob, but I eventually came around. Kim never steers us wrong in the domestic arts. When last week my friend innocently mentioned that she was buying her daughter a Cake Pop making kit, let’s just say I gave her a look. And my look concerned her a bit. I was trying not to succumb to Cake Pop Rage, but it’s hard when you see the commercialization of a homespun recipe you’ve been making for years. No, I don’t hate America or capitalism. This is probably more of a simple case of, “Hey, world, I’ve been doing this first! Look at me! I’m so special!” I do concede putting a stick in your cake ball and making it a cake pop complete with cutesy-poo decorations is a winning idea. I realize that the rest of the world has now jumped onto The Good Ship Cake Pop, and you can easily find whole websites and cookbooks devoted to this multimillion dollar industry craft. However, I will share with you my way to make these, the original Kim way. I always tell people these are not so much difficult as they are messy and labor intensive. My friend Deana calls these high class Little Debbies. I call them hillbilly truffles. Whatever you call them, they are delicious and always a hit. Bake the cake in a 13 x 9 inch pan per package directions. 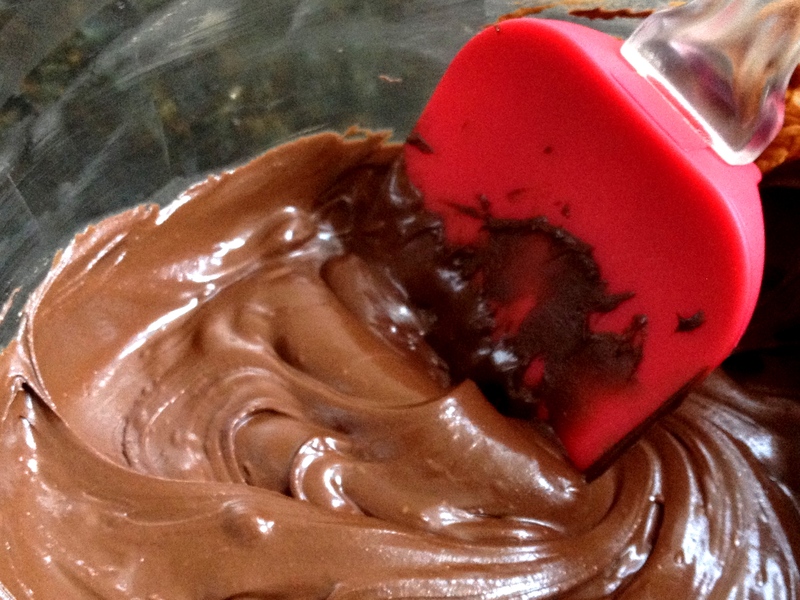 When cake comes out of oven, mix in entire jar of frosting while still hot. It will look like a mess. Chill until firm, about one hour. Roll the cake/icing mixture into small balls. Freeze the balls for at least an hour, preferably longer. Melt about half a bag of chocolate chips in the microwave. Using two forks, dip the balls in chocolate and place on a rimmed cookie sheet lined with waxed paper. 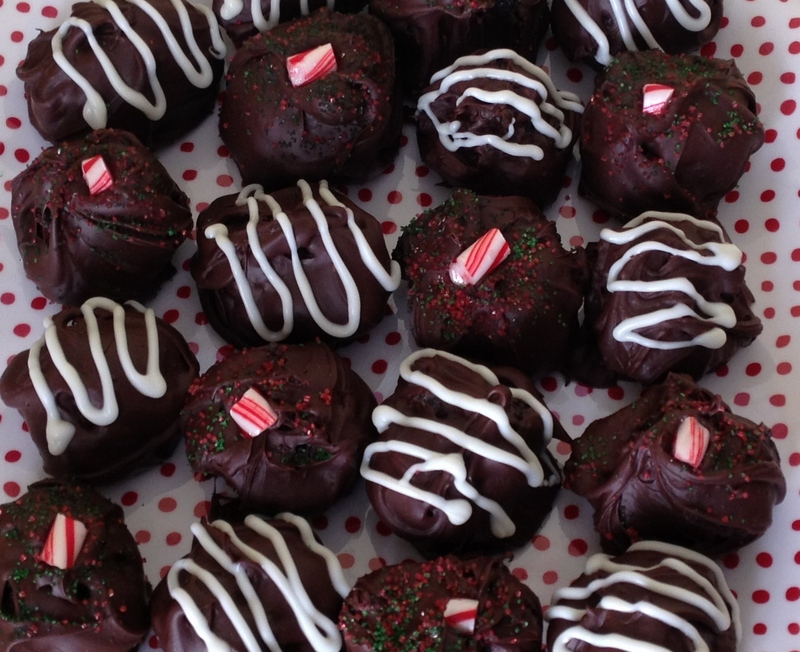 After dipping three or four balls, add sprinkles or decorations before the chocolate dries. After about ten cake balls, wash and dry your bowl and melt another half bag of chocolate chips. You may have to repeat this three or four times, but it’s better than trying to dip them all in the same batch of melted chocolate. Trust me. Step 2: Frosting mixed thoroughly into cake. 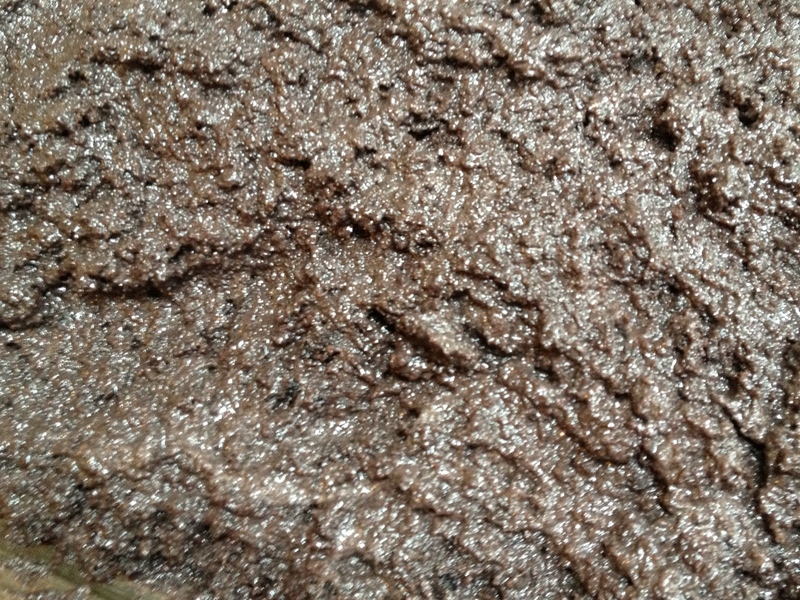 Note the sludge-like appearance. This entry was posted in Desserts and tagged cake balls, cake pops, Holiday desserts, Kim's Jingle Balls by Mom Mom's Apron. Bookmark the permalink. Also, I refrigerate the gooey mess overnight usually. Complicated jingle balls are a two day process. Then I use a small Pampered Chef scoop to make the balls. I don’t freeze first. They’re pretty chilled from the overnight stay. But yes to the dipping only a few and then melting more chocolate (the only way to go). Hi Queenie! Yes, I do agree overnight is ideal. I didn’t want to scare people off and turn this into a two day project, but I frequently divide it up by chilling/balling/freezing on day one, then dipping day two. Or, like you, just leave the gooey mess overnight. Sometimes I keep some undipped balls in the freezer for emergency snacks, too. I seriously need to try this. Don’t know why (probably because I’m such a rule-follower) but I just stick to the original recipe. However it does stand to reason that better ingredients make a better product. Or maybe it just seems WRONG to do such things to a homemade cake, but it’s fine for a boxed cake. There is no figuring out my logic. Maybe this will be the year I FINALLY make them. They look fantabulous, Dawn. I just mixed up my goo. Jutta, how did they turn out? Let me know! I saw cake pops at Starbucks the other day and I wondered if they weren’t the same as Kim’s Jingle Balls on a stick? Thanks for setting me straight! My Jingle Ball goop is in the fridge as we speak! I went with vanilla scratchy cake, vanilla scratchy buttercream, dipping into white chocolate chips and sprinkling with crushed candy canes.